Raise your hands those of you that remember seeing the 1993 (20 years ago!) angst fest that was Indecent Proposal. Was you Team Woody or Team Robert? Well, treasure those beloved memories because the original story is far different from the wildly popular film adaptation. This book explores so many emotional, historical, societal, and contemporary issues, that it makes the film look positively flat. We all know the story – apparently happily married couple try their luck in Atlantic City, get propositioned by a billionaire, and deal with the repercussions. However, the novel explores the still relevant issue of Arab vs Israeli conflicts. Joshua is Jewish and has had harrowing experiences of WWII, and Ibrahim (the billionaire) is Arab and has his own views. Although this may sound a strange aspect to write about, it actually adds to the morality tale. It isn’t just simply a question of “would you spend a night with anther person for $1,000,000?” – the different cultural and historical layers all play a part, especially in the aftermath of dealing with fall out from decisions made. The character development in the book is really strong. Joan and Josh are not two naive high school sweethearts – they’ve been around the block a few times. Throughout, you will (or at least I did) love and hate these characters with equal measure. No one is perfect, and no one is correct all of the time. This is not a comfortable read by any stretch of the imagination. At times it feels so authentic that you feel like you are a fly on the wall. The discomfort is what really makes this novel; the rawness, emotion, morality, faith, lack of faith, missed opportunities, that you witness when reading this novel, is what sets it apart from most other morality tales. Just like real morality and real humans, this tale will take you all kinds of directions – some expected and many not. At only $4.95, go and treat yourself to a different kind of novel that will question everything you have ever believed. 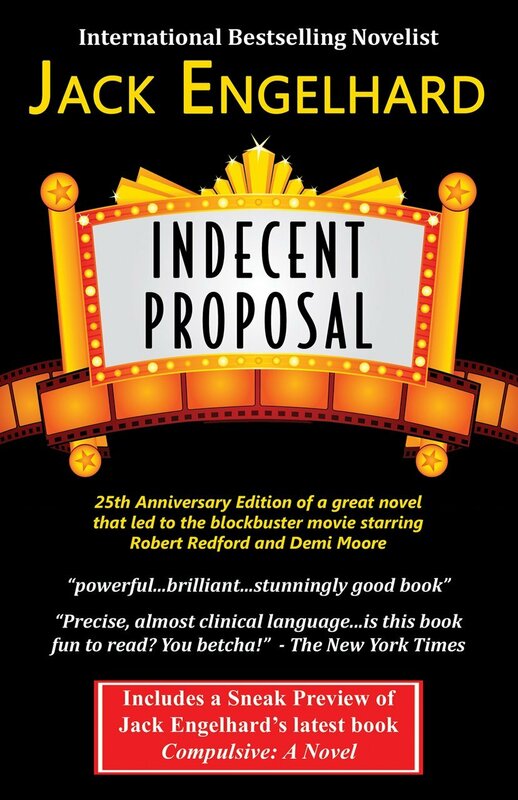 Thanks for writing such a favorable review of Jack Engelhard’s novel Indecent Proposal. We recently published the 25th Anniversary Edition, and was wondering if you’d be kind enough to use the NEW cover image instead of the much older one you have posted with your review? If you need JPEG images, let me know and I can send them to you via e-mail. Also, would it be possible for you to post your review to the NEW edition on Amazon? Hi Paul, thank you for your kind words. It was my pleasure to write this review. I have updated the image, and I also posted the review to Amazon. I look forward to reading more of Jack Engelhard’s novels and writing reviews! Thanks for your reply and for updating the book cover image and also for posting the review on Amazon. When clicking on the Facebook link to share the review, the OLD book cover still appears. Is that something you’re able to change as well so the NEW book cover shows instead?